An engagement ring is one of life’s most significant purchases. It may well be among the most expensive purchases you will ever make. While buying an engagement ring is exciting, it can also be a bit overwhelming. You want your partner to love the ring, but you also want to be thoughtful about your budget. There are no rules about how much you should spend on an engagement ring. The important thing is to have a budget in mind before you go shopping. There are many beautiful and affordable options that will accommodate any budget. Here are four ways you can save money and find the perfect ring! Up to 75% of all diamonds sold in the United States are cut into what is known as the Round Brilliant shape. This diamond cut is very popular because it so beautifully reflects light and sparkle. Because of its popularity, however, Round Brilliant cut diamonds can cost up to 40% more than other diamond shapes. To save money, consider one of the other beautiful diamond shapes available. Highly popular no-round shapes include Princess, Marquise, Cushion, Emerald, and Oval cuts. Next to diamonds, sapphires are the second most popular center gem for engagement rings. Their hardness and durability make them suitable for everyday wear. Sapphires cost much less than diamonds, which means you can get a larger gemstone while staying within your budget. Not only are sapphires found in deep blue shades, they are also available in almost every color of the rainbow. 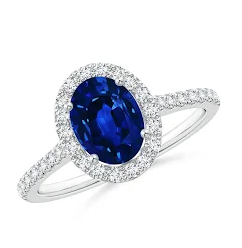 Sapphires are often paired with diamond accent stones. They are many other colored gemstones stones that also work well for engagement rings. Colored gems deemed durable enough for everyday wearing include Ruby, Spinel, Topaz, Iolite, Garnet, Amethyst, and Tourmaline. Always check with your jeweler, however, for the final word on the gemstone that interests you. Diamond prices increase exponentially with size. A one carat diamond costs more per carat than a 0.75 carat diamond. Smaller accent diamonds are much less per carat weight than larger stones. One way to save money while still achieving a “big diamond look” is to choose a Halo Setting for your engagement ring. This style of setting features lots of glittering diamond accents around a center stone. 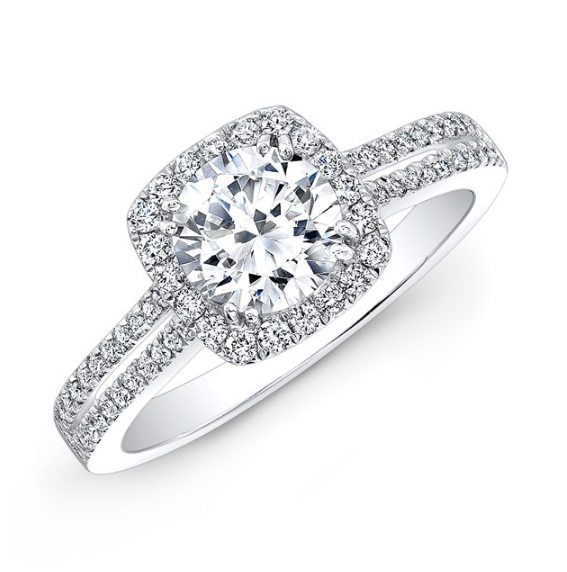 A smaller center stone with halo accents will give the illusion of a larger diamond. There are many stunning, contemporary ring designs that do not feature a prominent center gem. These designs cost significantly less than settings with major center stones. You can also choose several rings to be worn stacked together. Each ring can have a special symbolic meaning for you and your loved one. Make sure you work with a reputable jeweler that you can trust. Read online reviews about stores you are considering visiting and ask your friends for recommendations. Turley Jewelers offers a relaxed, low key atmosphere for your shopping enjoyment. Our knowledgeable staff of jewelry professionals will be happy to answer all of your questions and guide you through the process of selecting your engagement ring. Whatever your budget, we will help you find the perfect ring! Please visit us at our Pinecrest Village location at 11219 South Dixie Highway, Miami, FL 33156. You can contact us by phone (305) 252-1123 or email us at info@turleyjewelers.com. We look forward to hearing from you! Newer PostRose Gold Is In Vogue!